Pulse bread in food processor until coarsely ground, you should have a bout 1 cup crumbs. Melt 1 Tbsp. butter in 12" nonstick skillet over medium heat. When foaming stops add crumbs, shallot, 1/8 tsp. salt and 1/8 tsp. pepper. Cook stirring occasionally until golden brown. 7 to 10 minutes. Stir in 1 Tbsp. parsley and transfer to plate to cool. Wipe skillet with paper towels. 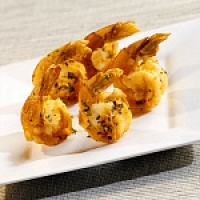 Thoroughly dry shrimp with paper towels, toss with sugar, 1/4 tsp. salt and 1/4 tsp. pepper in a bowl. Return skillet to high heat, add 2 tsp. oil and heat until simmering. Add half of the shrimp in single layer and cook until spotty brown and edges turn pink, about 3 minutes (do not flip shrimp). Remove pan from heat and transfer shrimp to large plate. Wipe out skillet with paper towels. Repeat with remaining 2 tsp. oil and shrimp, transfer shrimp to plate. Return skillet to medium heat and add 1 Tbsp. butter. When melted add garlic and pepper flakes, cook , stirring frequently until garlic just begins to color, about 1 minute. Add flour and cook stirring frequently for 1 minute. Increase heat to medium high and slowly whisk in sherry and clam juice. Bring to simmer and cook until mixture reduces to 3/4 cup, 3 to 4 minutes. Whisk in remaining 3 Tbsp. butter, 1 Tbsp. at a time. Stir in lemon juice and remaining Tbsp. parsley. Reduce heat to medium low return shrimp to pan and toss to combine. Cook covered until shrimp are pink and cooked through 2 to 3 minutes. Uncover and sprinkle with toasted bread crumbs. Another wonderful shrimp recipe! Sounds like you live in the Seattle area - this is something I would cook! This is a recipe for me to drool over. Can't wait to try it as seafood is my alltime favorite. Hi '5' from me for this for sure. Always on the lookout for great new seafood recipes and this one made the list!! Thanks! Yummy, I love shrimp and this sounds delicious! Wish I could pluck one of those lovely little shrimps right off the screen! They look so good! What a great recipe. Absolutely Fabulous!!! Thanks for sharing. On the short list!! High 5 to you.